Our Babies just can't have enough soft and cuddley blankets. So Baby Camo is being introduced into our knit wear line of Camouflage Clothing. This Camouflage Tuck Jacquard Blanket is delicately colored in the same white/blue/pink/natural yarns as the rest of our baby items. This allows you the opportunity to create a whole ensemble co-ordinating the sweaters, booties, caps, pants and blankets. Our soft cotton yarn makes all of these baby items very special. Check out the 'baby set's where you can save money! Cotton is 100% natural. It is nature's finest fiber. Just the thougt of cotton brings the feeling of comfort and gentleness to the touch. Our babies deserve the best! Our soft cotton will feel great on Baby, this will make you feel great too! 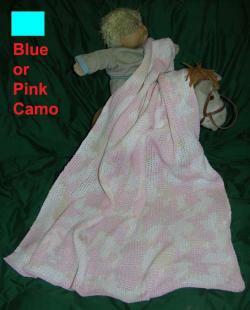 Pink Camo is a 3 color combination of white, pink, and natural color. Blue Camo is a 3 color combination of white, blue, and natural color. Proper Care: Washing your cotton knits is as easy as turning the dials of your washer and dryer. Use a gentle cycle, warm water and a mild detergent. Do not use Woolit or bleach when washing cotton. Tumble dry on warm, removing just before it is completely dry. Lay flat to finish drying. That is all there is to it!